What is a hungry geek to do when it’s dinner time but video games are calling? If that hungry geek is tinkerer extraordinaire Ben Heckendorn, he’ll build some kind of awesome gadget to let him enjoy food and gaming at the same time. Heckendorn, better known as Ben Heck, shows viewers of his videocast how to make some pretty geektacular video game-related devices. The video above shows Ben Heck solving the age-old gamer problem: how to eat a Hot Pocket without putting down the XBox controller. The solution is surprisingly elegant and undeniably effective. In this video, Ben Heck shows viewers how to avoid standing by the stove to stir the pan of Hamburger Helper. 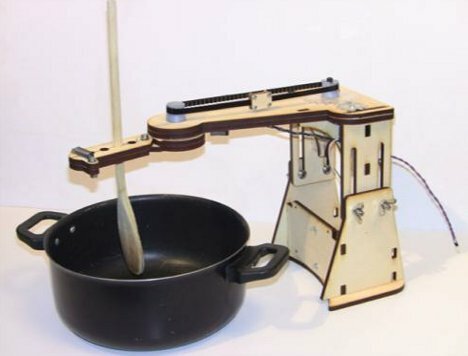 An Android tablet controls a robotic arm that keeps your delicious meal from sticking and scorching while you comfortably surf the web in the other room.